Beginning today, we are expanding our presence in food-forward San Francisco with the unveiling of #BeyondSausage at Rosamunde Sausage Grill at their Mission Street, Haight Street, and Oakland locations! "It's always been important to us to have a vegan sausage on the menu to serve the diverse needs our customers, and have long been searching for a better option, something without gluten and soy, and that would appeal more broadly to all our customers" said Josh Margolis, owner of Rosamunde Sausage Grill. "The minute I took a bite of Beyond Sausage and tasted the explosion of flavor, and felt the signature snap of the casing there wasn't a doubt in my mind that we needed to put this on our menu. Our customers are going to go nuts for this." The first plant-based sausage that delivers on the juicy, satisfying taste and texture of pork sausage, Beyond Sausage is available in three traditional sausage flavors -- Original Bratwurst, Sweet Italian and Hot Italian -- that will satisfy the appetites of carnivores and vegetarians alike. In continuation of Beyond Meat's commitment to creating better-for-you protein options, the Beyond Sausage has 16g of protein per link, more than that of traditional pork sausage, and 38% less saturated fat. 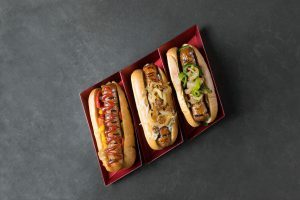 A San Francisco favorite for sausages, Rosamunde will offer all three Beyond Sausage flavors alongside the other meat-centric options on their menu. Fans can enjoy their Beyond Sausage links either as a plated option, served with salad and baked beans, or in a with a bun with two house-made toppings. Toppings include grilled onions, sauerkraut, sweet onions, hot peppers, mango chutney and more. For a vegan-friendly option, simply ask to have your sausage served on a baguette. Hailed as a miracle of meatiness, Beyond Sausage is the first sausage you actually want to know how it's made. A blend of pea, fava bean, and rice provide the protein, while trace amounts of beet juice lend the meaty red color. Coconut oil ensures mouth-watering juiciness, all wrapped in a 100% plant-based casing derived from algae. A first of its kind, Beyond Sausage has no GMOs, soy or gluten. In the Bay Area? Be sure to stop by Rosamunde to try one of the three mouthwatering Beyond Sausage flavors and share on social with #BeyondSausage for a chance to be featured on the Beyond Meat channels. Not in the Bay Area? Don't fret! 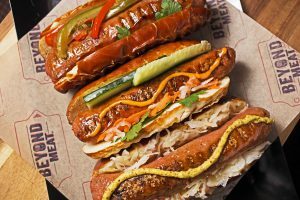 Beyond Sausage will continue popping up around the country so be sure to sign up for Beyond Meat's newsletter to stay up to date on the latest announcements and check out the most recent Beyond Sausage Savants in LA and NYC here.